Using a hand whisk, mix the coconut flour, psyllium husk powder and baking powder in a bowl and combine well. Add the butter and eggs and mix thoroughly until the mixture looks like breadcrumbs. Add the chia and pumpkin seeds and gently combine into the dough mixture, using a spoon. Boil the water and add to the mixture a bit at a time, stirring thoroughly until you have a dough. Wait for the dough to cool slightly before using your hands to shape it. Cut the dough into four equal quarters. Take one of the quarters and roll into about an 8 inch long log. 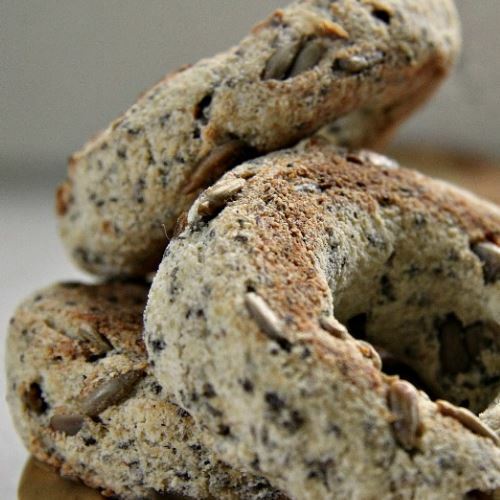 Join the two edges of the log together to make into a bagel shape, pressing firming. Place on a parchment covered baking tray and place in the oven. Bake for 15 minutes, then turn the bagels over and bake for a further 15 minutes. As well as being low carb they are a great gluten free alternative to the real thing, healthier too as they are high in fibre due to the combination of coconut flour and pysllium husk powder.